The world's third largest species of rodent will soon be making its appearance at Woodland Park Zoo. Can you guess what it is? Well, if you've looked below at the photos, you already know: the porcupine! 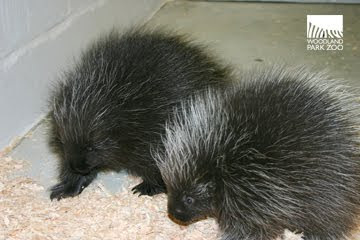 Two young porcupines will soon join the other animals in our award-winning Northern Trail exhibit. The pair, Molly and Oliver, is approximately 3 months old and came from Weickert's Wildlife in Bent, Minnesota. Molly is the larger and darker of the two, and even though Oliver likes to try and push her around, Molly steadfastly stands her ground. They also have decidedly gourmet tastes, preferring willow branches over apple and delectable treats such as peanut butter. Porcupines (the term is derived from the Middle French porc espin meaning "quilled pig") are in the order Rodentia which also contains mice, rats, the South American capybara -- the largest rodent species -- mole-rats, and chinchillas, among others. Beaver, by the way, are the second largest rodent species. 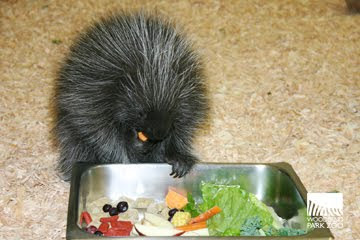 There are about 29 species of rodent considered to be porcupines and inhabit the Americas, southern Asia and Africa. Molly and Oliver are the North American species, Erethizon dorsatum, and are found throughout Canada, Alaska and northern and western U.S. with small populations in West Virginia, western Virginia and northern Mexico. Mostly nocturnal, they are herbivores and subsist on roots, grasses and to the chagrin of some, will strip trees of bark and even eat plywood, in search of the salts used in its manufacture. They are most noted for their unique spines or quills which are actually thickened, modified hairs made of keratin, the same substance as finger and toe nails. 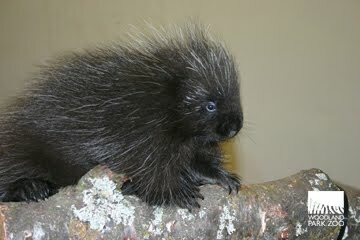 Despite the popular legend, porcupines cannot shoot quills, but will warn potential attackers by swinging their quill-filled tail, the barbed quill ends easily embedding themselves in tender flesh. As with every animal that comes to the zoo, they are currently in a 30-day quarantine period and being cared for daily with toys and treats. After a thorough medical exam at the end of the quarantine, Molly and Oliver will be slowly introduced to their new exhibit where they will, hopefully, mate and produce a new generation prickly offspring once they've become mature. Learn more about these fascinating animals on our Porcupine Fact Sheet at www.zoo.org/animal-facts/porcupine. The plan is to introduce them to their new home in late July, so drop by and see them! Photos by Jo Roach/Woodland Park Zoo.